Baptist Medical Group physician assistant Julie Baltz, MHS, PA-C, NFPMC, recently received certification as medical consultant in natural family planning from the Pope Paul VI Institute in Omaha, Neb. 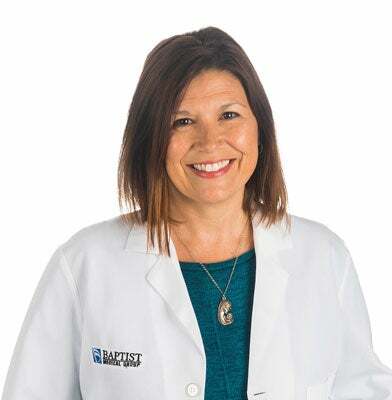 Julie is currently welcoming new patients at Baptist Medical Group Primary Care – Live Oak located at 2896 Gulf Breeze Parkway in Gulf Breeze. This certification of natural family planning allows Julie to be a fertility counselor to individuals wanting to start using, or those who currently use, a fertility awareness based method named the Creighton Method of Fertility Appreciation. It provides an option for individuals to recognize the signs within their bodies that teach them how to track the symptoms and days of fertility for each month. The information gained can be used to achieve or postpone a pregnancy or diagnose potential health problems. Baltz has both the certifications and experience to provide quality, compassionate care. For more information, visit BaptistMedicalGroup.org. Baptist Health Care is a community-owned, not-for-profit health care organization committed to improving the quality of life for people and communities in northwest Florida. The organization is a proud member of the Mayo Clinic Care Network. A 2003 Malcolm Baldrige recipient, Baptist continuously strives to be a national leader in quality and service. Baptist Health Care includes three hospitals, two medical parks, Andrews Institute for Orthopaedic & Sports Medicine, Lakeview Center, Baptist Medical Group and Cardiology Consultants. With more than 6,500 employees and employed physicians, Baptist Health Care is the largest non-governmental employer in northwest Florida. For more information, please visit www.eBaptistHealthCare.org.